Sin. One little word that has the capacity to do an extreme amount of damage to one’s self and others with irrevocable consequences cannot be ignored. No one likes to talk about sin, but we at least need to be able to talk about it in prayer. “Can I recall any moment today where I clearly know that I sinned? Did I feel convicted by the Holy Spirit over any of my actions today? Do I have any bad habits that need correction? What things did I fail to do? When I answer Yes to any of these questions, I note it in my prayer journal (confess), and pray for God’s help to not repeat it (repent). I’ve got all of this grace and mercy that comes along with the gift of salvation, and I just can’t take it for granted. I want to be aware of where my flesh is struggling and submit it to God for His help. When I first read Paul’s assessment of the Corinthian church, I thought him a little too demanding. I mean, really, this church is doing far better than most, and he wants to get onto them about their giving??? Truth is, God wants us to do well in every area of our life. Obviously, we cannot do it in our own strength so He empowered us with His Holy Spirit, which yielded us the fruit of the Spirit. The fruit of the Spirit describes what a Spirit-controlled life looks like. The problem is that we are not always quick or consistent when it comes to employing them. We erroneously believe that we must pray for more patience for instance, but truth is, we always have the perfect amount of patience, as God’s Spirit that indwells us is perfect. Utilizing the fruit of the Spirit is how we overcome sin and self. Take a moment and reflect on my above self-assessment questions against the fruit of the Spirit and see what shortcomings God reveals in you. I almost make this exercise sound exciting, don’t I? Well, it is, because I can tell you that after years of prayer journaling, using this compartment, I have experienced the most spiritual growth there than from any of the others. 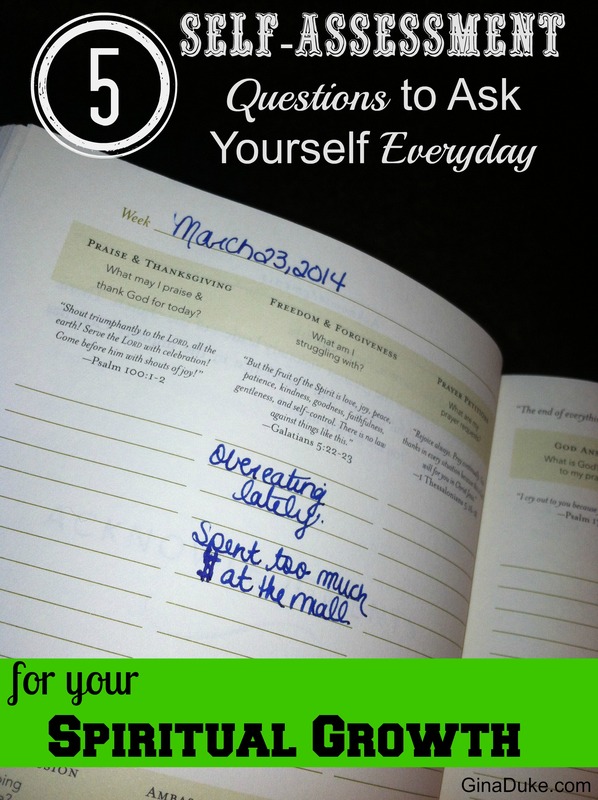 Tomorrow, I am going to talk about prayer journaling our prayer petitions! Very thoughtful post! We sometimes shy away from conviction without recognizing it for the precious gift that it is: the opportunity to turn back to our relationship with our Savior. Thank you for this biblical encouragement! God bless you more Richly ma.